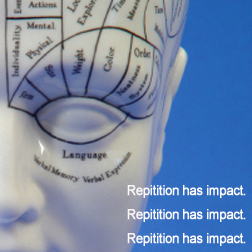 A few years ago, there was an interesting study conducted on the power of repetition. Specifically, the work done by Kimberlee Weaver (Virginia Polytechnic Institute), Stephen Garcia and Norbert Schwarz (University of Michigan), and Dale Miller (Stanford University) demonstrated that repetition from a single source infers the popularity of an opinion across an entire group. It's our brains. They tend to trick us. And in this case, they tend to trick us consistently, given that the researchers constructed six different experiments to show it. The opening nails down the research. "From college students gauging their peers’ views on alcohol, to stockbrokers speculating about consumers’ confidence in the market, to everyday Americans wondering how scared others are about terrorism, our estimates of group opinion affect not only the decisions we make on behalf of groups but also our perceptions of reality." ... However, "perceivers integrate information about the number of times they have heard a sentiment expressed [without] information about the number of people who have expressed it." The same idea applies to the credibility of the sources. It hardly matters. The more familiar the opinion seems, the more perceivers think that they have heard the opinion from multiple sources — even if it comes from one source or less credible sources. The opinion itself feels familiar through repetition. How did the researchers test their theory? 1. Participants reading opinions in favor of open space preservation were more likely to support open space preservation when they read similar opinions from three different sources and one opinion from a single source, three times. 2. Participants believing they were helping a company make a decision about whether to hire a CEO from outside the company were swayed by three employees suggesting it and one employee suggesting it multiple times (saying the same thing in different ways). 4. After being exposed to a string of words related to open spaces (a similar scenario as in number 1) or neutral words, participants were more likely to support open space preservation if they had been exposed to a string of words related to open spaces. 5. In another study, researchers tested repeated opinions that were contrary to what participants knew to a specific group's preference to be. This was the only time that repeated opinions had no affect on the outcomes. 6. In the final study, the researchers provided one statement of opinion to a group, one statement repeated three times, and three similar statements from three different people to test their theory against time delays. They were then asked how they perceived the opinion as it was representative of a group immediately after the presentation and after a time delay. Interestingly enough, agreement with one opinion waned whereas agreement with the repeated or reinforced opinion increased over time. What does this have to do with marketing and public relations? In connection with earlier research on how misinformation spreads, repetition seems to have significant weight in shaping our perceptions, provided a pre-existing opinion doesn't already exist. (In which case, people tend to have a defense mechanism against changing their opinion, even if it is wrong.) It doesn't matter whether or not we receive the information from multiple sources as much as the information is repeated by the same source. This is a pretty significant study when coupled with the more recent study on misinformation. It sheds some light on why children, for example, tend to adopt the opinions of their parents, even when those opinions represent inaccurate bias. It also shows how difficult developing objectivity as a skill set can be if the communicator doesn't vary their sources of information. Ergo, one biased media source will eventually be able to frame the narrative of policy, position or candidate merely by repeating similar statements over and over. Without any countering opinion, the study suggests people will be that much more likely to adopt that opinion and even feel that the opinion is somehow reflective of the population (whether it is or not). On the flip side, it also shows how marketers are better positioned by focusing on a few clear messages than attempting to sell everything.